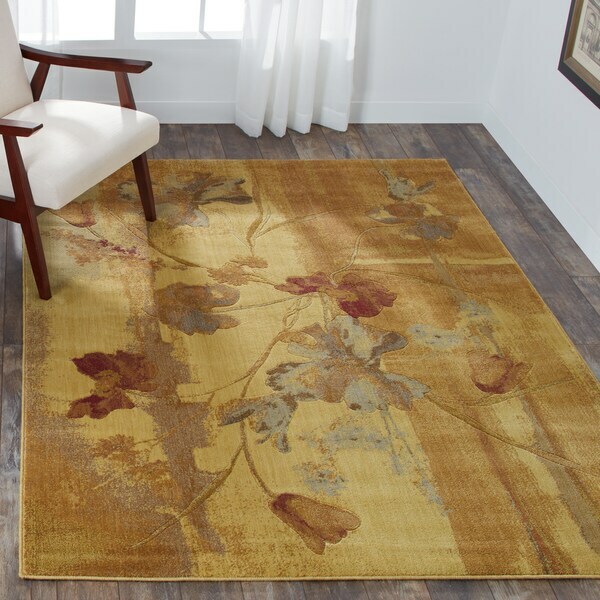 Nourison Somerset Multicolor Rug (5'3 x 7'5) - 5'3" x 7'5"
Adorn your home with a beautiful watercolor painting you can walk on with this lovely area rug from Nourison. With its dark beige color and subtle red, green, ivory, and blue accents, this rug will complement a wide variety of styles. Pretty rug. Background is MUCH darker than pic. I purchased this rug for the price because I'm so tired of buying high end merchandise only to have my 2 dogs and cat do something sneaky while I'm not looking and ruin (pet owners you will understand completely) and have to throw it away for one reason or another. I put this area rug under the coffee table in my living room. My living room furniture is dark cream couches, white-washed oak and marble end tables and coffee table darker beige walls. The accent colors are green,blues an maroon. (same as rug) I expected the background of the rug to be much lighter than the actual rug. The background has no cream color in it at all. Basically, gold-ish, dark beige (if that's what you would call it). But, I'm keeping rug because it is really pretty and the darker water colors make a statement. Go for it! I bought this rug to replace an old Crate & Barrel rug in my living room. It is basically what I expected after reading prior reviews. The quality of the rug is good - it is soft and seems like it will hold up well. The colors (to me) appear more muted and the reds and blues do not seem to stand out as much in person as they do on my computer screen (they appear more beige like the rest of the rug). For the price I think it is a great value. It was about half the cost of my old rug and the quality seems just as good. (In fact, it isn't shedding at all that I can tell whereas my old rug shed from the day I bought it until the day I threw it out 6 years later). The only things I don't love are the monotone colors (I would like to make the blues and reds stand out a bit more) and the fact that the flowers and stems are outlined with an indented groove in the surface of the rug (I'd prefer that there be no outline). This rug looks great in my living room. I picked it because I liked the design - wanted something a little different from the typical border/floral design. I'm very happy with how the design looks in my traditional living room and the quality of the rug's weave. It's soft and supple, but not as heavy as the area rug I replaced. I think I got a good value, and haven't seen anything better for the money, after looking for months. Beautiful & well made rug -- but it is GREEN not beige. Oh how I wish it was the color shown here instead - I wanted this to be 'the' rug for me! This was a big surprise to me. The quality of this rug is way above the price & it's beautiful. I really like the rug. The colors are perfect for the room I have it in. It has an old antique look to it. It does have an area that looks as though the dye did not take or it faded. I would definitely recommend this rug. Really pulls the colors in my room together. I love my rug it looks so pretty on my floor the colors great I looked a long time before I found this rug and the color, thinking about another one in a runner . Love the colors & thickness of this rug. Very happy with purchase. I will agree with most of the reviews, just wished I had read all of them--this rug is NOT beige--it is green, not what I expected or wanted-to much of a hassle to return-so I will put it in my laundry room, if you like green this is the rug for you, it is a very attractive pattern and well made-I am bummed out on the color. It's exactly what I expected. I plan on using this rug under my dining table. Beautiful, picture does not do it justice. I was very comfortable in ordering this item. Since I had to change my address etc. since last purchasing I felt very comfortable with the assistance of your customer service rep. She is certainly an asset to your company. I look forward to receiving the rug and place it in our new home. It looks the same as the pictures. it is soft to walk on. Very nice looking rug. I wish the pattern was a little more vivid but overall, It's really good looking. Very nice rug . Would order again. I liked the subtle design of the rug. Goes with what we have in our room.